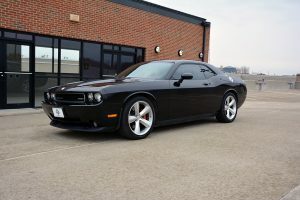 This Challenger features the amazingly powerful and smooth 6.1L Hemi engine, 5 speed Auto trans, 20″ OEM wheels, black power leather and suede seats, power everything, navigation, and much more! Under the hood, this Challenger features the 6.1L HEMI engine which produces 425 horsepower and 420 ft-lbs of torque! She makes her peak power at 6,200 RPM and peak torque at 4,800 RPM. The Challenger puts the power to the wheels through the stout W5A580 5 speed automatic transmission and 3.06 ratio rear differential. 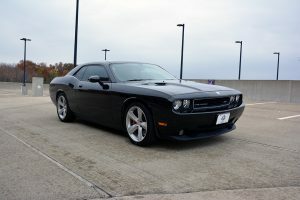 This Challenger is a stunning “Brilliant Black Crystal Pearlcoat” in color, and features gray racing stripes on the hood. This Challenger is optioned out with all of the goodies you would expect in a car with an MSRP of $42,000. Both front seats are heated, with the drivers seat featuring the memory function. 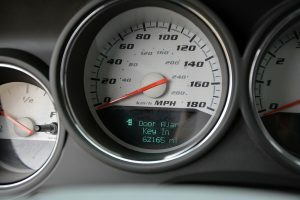 The Navigation unit in this Challenger features an internal hard drive to store pictures and music. Your music is played through a Kicker speaker system with factory subwoofer. All four OEM 20″ Alcoa Forged wheels are wrapped in Goodyear Eagle RSA’s size 245/45/20 in the front and 255/45/20 in the rear. This Challenger has also been fitted with a nice aftermarket exhaust system that lets you know the 6.1L is there, but doesn’t overpower or drone out the radio. 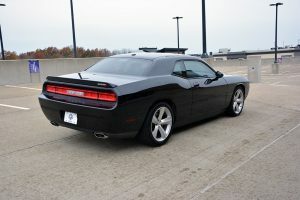 This Challenger was involved in a fresh water flood before we purchased it. 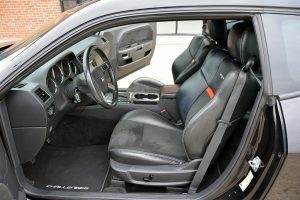 Upon receiving the vehicle, we stripped out the entire interior, including all the harness, and replaced the modules and interior components with an interior from a separate 2008 SRT-8 donor Challenger. As you can see from the pictures provided, the vehicle was stripped down to bare floor pans and thoroughly cleaned. All of the electronic modules in the vehicle we replaced from the donor. 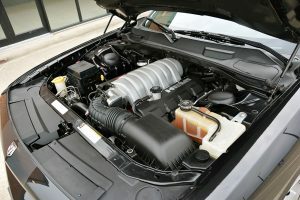 The engine computer was purchased new from Chrysler. The windshield was also replaced due to a crack in the original. The vehicle has been taken to the Ohio state highway patrol for inspection, and has been issued a salvage rebuilt title that is transferable to all 50 states. 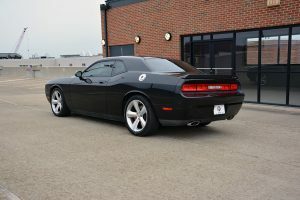 We have put over 500 test miles on this beautiful Challenger since completion. The title will read “not actual miles” due to the insurance company not putting power to the car at auction. CLICK THIS TEXT TO SEE PICTURES OF THE COMPLETE REBUILD FROM THE TIME WE GOT THIS VEHICLE, TILL YOU SEE IT NOW. There are some marks in the paint consistent with a 60K mile vehicle, but overall the car’s finish is in good shape. The seats, and other leather interior components are in very nice shape.